Sophia is a J-Psy. She’s a justice Psy, able to read the minds of people who have committed terrible crimes and then take the image of what they did and pass them on to others. That can then be used in court to prosecute them. And what can be greater evidence than the testimony of the killer’s own mind? Again? Really? 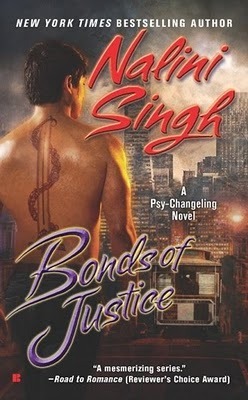 This is the 8th book in the series and so far all but one of them have included a main female character who is either imploding because of her Psy powers (Sascha, Faith) or deeply traumatised by her past (Brianna, Talin, Katjya) or on the run and are an actual distrusted prisoner (Ashaya, Katya again) – always we have the terrible fragile and/or broken and/or vulnerable woman who needs to be saved by the big strong man. I think what makes it more glaring and annoying is that the man in this series are also traumatised. Judd struggles with his abilities (which are lethal because he’s male so allowed to have lethal powers) as does Dev. Lucas, Dorian, Vaughn and now Max have all had traumatic, terrible pasts. But none of them are 2 seconds away from utter destruction/meltdown. None of them need saving or putting together. None of them are dealing with PTSD or fear – none of them are fragile. At most they need “melting” or “thawing” because they’re big strong manly he-men of manliness and trauma just turns them into diamond hard weapons of tough ruthlessness, rawr; while women become puddles and wrecks and cower in a corner for a man to put together again – occasionally having flashes of temper so the man can announce how he likes a lady with spirit (or words to that effet). And I’m not saying that either is the correct way to respond to trauma. But where are the men cowering in puddles? Where are the women becoming iron hard, emotion-deadened ruthless scary forces? Both are viable responses but in this series they’re rigidly gendered. “Slow, he thought, he had to do this slow. She was so skittish, he’d have to stroke her into trusting him”. There is one moment where he does acknowledge he’s wrong to push her – but, almost hilariously – he then turns round and tells her to slow down. Not because he wants to, but because he knows she can’t take too much at once. He knows this, how? Again, this is a theme of these books where the man knows what the woman needs more than she does. Like Max being an excellent detective because he’s human and therefore not Silent so is therefore more creative and imaginative. Or how his natural shields make him incorruptible – along with the pressure put on Sophia could expose a lot more about how the Psy manipulate the justice system. Or there’s the really fascinating examination of the J-Psy and their habit of extra-judicial “justice”. That’s a huge well of conflict and horror and difficult aspects to examine! Explore this more! Mooooore! C’mon this is fascinating and incredible – how can this just be the storyline in passing while we focus on the same damn romance story?! Whyyyy?! Or there’s Nikita’s clear dancing around the edges of Silence – oh I would kill for a book from Nikita’s point of view! But we’re focusing on a Ctrl+C romance? And I’m not against having a romance in this world and I quite like how this has slowly built the Dark River into a powerful network of their own – but the storylines are so repetitive at this point while the rest – the whole awesome rest of this series – is just begging, begging for more. I’m certainly begging for it! A lot of the racial diversity does link to the Psy – and neither Psy nor Changelings particularly reflect any human culture which means a lot of cultural, linguistic, culinary, religious and other markers which may go with different communities are completely absent. Race is a physical descriptor but rarely anything else. We also continue to have no LGBT people and now we’re on the 8th book this void looks more and more inexcusable.